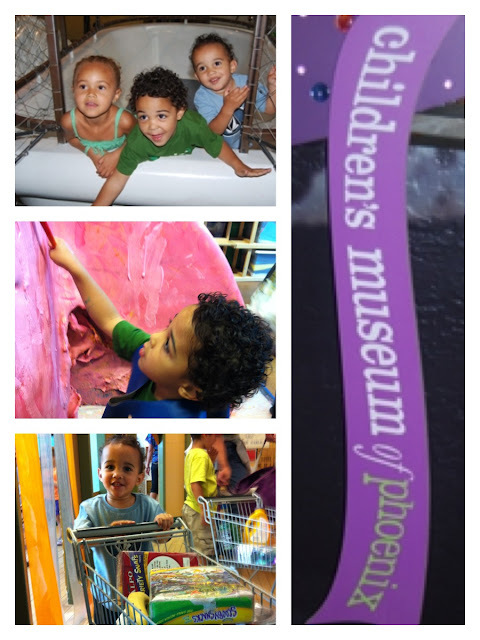 Shannon invited me to go along on Trey's preschool class field trip today to the Phoenix Children's Museum and without hesitation of course I said YES! Shannon has said on several occasions how much she really enjoyed this place, but her descriptions just didn't do this museum justice. This place is nothing short of FABULOUS and not just for the kids but the adults as well. Needless to say, I had a blast being able to see the boys enjoy all of the wonderful things the museum had to offer. It is even a little hard to say what their favorite parts were because there was nothing that they didn't enjoy and want to do over and over again. But for Boston I would say that it was probably a tie between the 2 Whoosh structures and the Pit Stop Racetracks. I think he could have stayed in either of those places ALL day and be totally content. For Trey, the Schuff-Perini Climber which towered above the atrium floor, it was like climbing a tree and probably the Racetracks as well. Boston drug me thru the climber a couple of times and it never ceases to amaze me that as much as I work out, doing something out of the ordinary had me using muscles that were very dormant Haha!